Do you love cutting down big trees with chains saws? There is something about that experience of setting up the notch, cutting through the trunk and just standing there as you watch a 50-year old tree go down easily. It is invigorating. But while that could be fun, most folks tend to use chain saws to attend to much smaller tasks such as cutting down firewood. With the black & decker lcs1240 40-volt cordless chainsaw, the experience is almost the same. Since its inception into the market, the black & decker lcs1240 40-volt cordless chainsaw has made a name for itself. 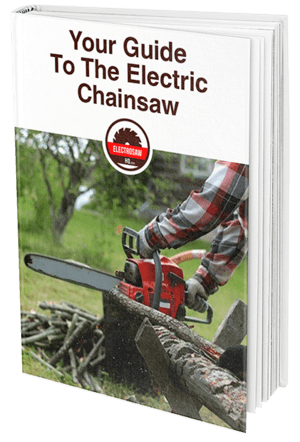 It has proven to be one of the most reliable cordless chainsaws in the market. Due to its ability to handle light and medium-duty tasks, we give it a rating of 4.5 stars. Based on customer ratings on online stores, the black and decker is definitely worth the consideration. When 90% of the consumers rate the product as either excellent or good, don’t you think it is a good idea to check it out. In this article, we will check out some of its main features, pros & cons as well as a sneak peak of some of its competitors. 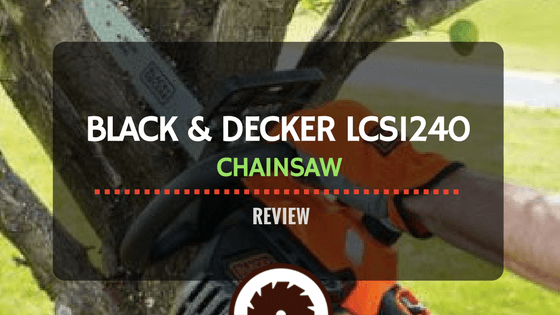 Hopefully, this Black and Decker 40V chainsaw review will help you get a better understand of this machine. How do these features set the black and decker apart from the rest? The most notable feature in the black and decker is its 40V battery that powers the chain saw without the need to use 2-cycle fuels. Well, you can still add some chain oil to keep the chain and bar lubricated, but as for the saw, it only needs the battery and the electric motor to get things started. As for the chain tension, it is controlled by a 2-step process, which starts by loosening the adjusting knob, which then makes it easy to tighten the tensioning knob. More details on its features have been discussed in the performance, efficiency and battery section. The LCS1240 is designed for cutting fallen limbs and pruning branches. It may not be very powerful but it can cut logs of up 12 inches in diameter. Now that we know its uses, how does it feel like to handle this chain saw? For starters, it’s a lightweight saw, which means it is easy to control. Most user feedbacks suggest that it is particularly popular with seniors and women. In terms of the average log size, it works best when cutting wood with a diameter of 8” and below. There are still users who have used it to cut down trees with diameters of up to 12 inches and it has performed pretty well. The only downside of using it to cut through large diameters is that it uses up the battery very quickly. Therefore, if you are looking to use it for larger jobs, you’ll need to have an extra black and decker chainsaw battery with you. Like most products, the LCS1240 has several areas that the manufacturer advises caution. Firstly, in case you want to use it to cut small saplings or brushes you are advised to exercise extreme caution. This is simply because, slim materials can easily catch your chain and either be whipped towards you or pull you off balance. Secondly, it is important to remember that the saw tends to bounce when trying to cut small or slender branches especially at the start. Provided that you are aware of all these issues, you will not have a difficult time using the LCS1240. Starting the LCS1240 is a breeze. You just need to hold it in a comfortable position, using your thumb engage the lockout button, press its trigger switch, and off you go. With this, you are sure to get rid of all the choke adjusting, fighting and priming that most experience with the gas saws. To summarize its performance and usability, the LCS1240 is a lightweight chain saw that you could carry with you to almost any place you want. Although it is advisable that you avoid using it in temperatures above 40° and wet weather to avoid battery related issues, the LCS1240 is a suitable for use especially if you are in a place without power points. In addition, you do not have to worry about working with long extension cords. The LCS1240 comes with a 12-inch low kickback bar and chain, which provides fast and smooth cuts. The Oregon branded bar and chain are designed to deliver unparalleled performance for both occasional and commercial users, while providing maximum protection against issues such as bar-nose kickback. As you would expect from such a quality bar and chain, they have excellent cutting efficiency. As for the guide bar, it has reduced kickback, this simply that means that it has gone through rigorous testing and has proven to reduce the seriousness and number of kickback events. Attached to it is an Oregon chain that meets the requirements of ANSI B175. 1 201- the standard requirements for this version. You should also note that despite these assurances, kickback can still occur and even cause problems especially if you fail to handle the saw properly. For example, kickback will most likely occur if the chain’s tip touches the tree. Fortunately, the LCS1240 is a lightweight saw; therefore, the operators should not have any problem trying to cope with the kickback events, provided that you handle it in the best way possible. In most chain saws, maintaining a tightened chain is vital to ensure you get the best cutting performance; fortunately, the LCS1240 has made this easy by adding a large tensioning knob. This means that no tools are required to get this done. You simply go to the side of the saw and adjust the tensioning knob, and you’ll be good to go. The only thing you have to remember is that the chain tension needs to be regularly checked and the motor has to be stopped before doing so. The chain runs at 5 m/s, which should provide enough speed for a decent cutting performance especially when handling small jobs. A well-sharpened chain is just as important as a well-tensioned chain. Therefore, you have to ensure that regularly sharpen it using a 4.5mm file & file folder. You can buy a sharpening kit for less than $10 or alternatively you can swap your chain for a new one; it will only cost you $15. The design and construction of the LCS1240 is similar to that of the LCS1020 version of the same. It features the same lightweight metal and plastic construction as the LCS1020 but it is not as robust as most gas powered saws. If you are have tried out a gas powered saw especially the larger models, the LCS1240 might feel like more of a toy than a saw to you. Although they are designed well, they are not designed for heavy-duty jobs, they are pretty power and can perform numerous tasks with no performance issues. The rear handle comes with a rubberized grip and a guard to offer comfort and protection for the right hand. As for the trigger switch, it is located underneath the handle, while the lock-off button is located on top. Unlike most chainsaws, it comes with a half-warp front handle that is designed solely for protection and not to function as a chain brake. This should be an issue especially considering its size where the severity of the kickback incidents is most likely lesser than that of larger machines. On the right-hand side of the LCS1240, you’ll find a sprocket cover, chain-tensioning knob, and bar adjust locking knob. The saw comes unassembled, which means that you need to fit the bar and chain. The assembling process should be easy as it comes with a full set of instructions and a diagram to help you figure out the parts. The battery is located on the left-hand side of the power unit. This makes it easy to slot in and out without the need to use tools. The black and decker comes with a 40V Lithium Ion battery, which the manufacturer claims that can hold its charge for close to 18 months. The 40V battery is interchangeable with other batteries in the 40V range. So, what does a 40V Lithium Ion battery mean for cutting life? The Black & Decker claims that on a single charge it can power the saw through 60 4-by-4 pine lumber cuts. The amount of times it takes for the battery to run out will depend on the intensity of the task you are undertaking. However, you should expect that it will provide a cutting time of about 30-45 minutes. Therefore, if you are looking to handle larger jobs in a single session, you will need to have an extra battery. You also need to remember that only a Black & Decker 40V battery can fit in this machine, this means that you cannot fit in another battery, say a 40V Dewalt battery. The good thing about this battery is that it does not have a memory effect; you do not have to wait for the battery to completely run down before you can recharge. The LCS1240 comes with a battery charger that takes about 4-5 hours to charge fully. It may not be the fastest in the Black & Decker line but it does a pretty good job. However, if you want a charger that could do the job a little bit faster then go for LCS 40 Fast Charger. It will get your battery fully charged in about 1 ½ hours. Due to this, you have to factor in the task in your schedule so that you can plan ahead and ensure that the batteries are fully charged. The Black and Decker chainsaw oil system is fully automatic to ensure that it provides a regular flow of oil to both the bar and chain. This means that you need to release the oil manually when using the saw. The only problem with this is that you cannot adjust the flow rate as it is only released at a constant rate, irrespective of the condition you are working in or the task you are working on. The LCS1240 has a capacity of about 3.7 oz. A quart of chain oil can fill the reservoir for up to nine times. You can also carry out regular checks on the oil levels, which has been made even easier by the addition of a transparent window. If the level goes below a ¼, you should refill top up. This section will focus on several chainsaw models that compare to the LCS1240 model. Some of the models discussed have similar features, and only minor differences can be noted between them. The ego power differs with the LCS1240 model in so many aspects. For instance, the Ego power is powered by a 56V battery that utilizes arc lithium innovation to deliver high amounts of power. In essence, this chain saw is better in terms of performance and cutting speed. The Makita XCUO2Z is a unique machine that is powered by two 18 Volts LXT lithium-Ion batteries. Generally, this tool requires 36 Volts to run as compared to the LCS1240 model that requires 40 V batteries. This tool has a front hand guard to protect you as well as actuate for the chain brake. The good thing about the two models is that one does not have to change the engine oil or spark the plug. Both machines are fitted with wide guide bars to increase their cutting capacity. Novice users can use the machine easily as well as make straight and smooth cuts. These machines are designed for light outdoor activities only. The Scotts S20510 is a cordless chainsaw that is considered among the best chainsaws due to its price, power, reliability, and efficiency. The most unique thing about the S20510 is the inventive charging station, which allows you to charge the 20V battery on its own or on the device. In addition, the wall-mounting charger can be used as the holder and handle. The main difference between the two models is that the LCS 1240 requires more power to run the engine, unlike the Scotts S20510. This machine should be used by a pro due to its power. If you are looking for a lightweight and affordable chainsaw for small tasks around your home, then the LCS1240 is the ideal tool for you. It has excellent features that ensure a seamless performance when cutting small trees. Overall, it is a nice tool and it is definitely worth the price. A good alternative to this product is the black and decker chainsaw 20V LCS1020.